HELLFIRE TRADING XBOX ORIGINAL CONSOLE RGB SCART HD TV AV CABLE - BRAND NEW This is the RGB HDTV AV High Definition AV Cable for Xbox Features: This RGB AV cable is exclusively for use with Xbox console Enables displays with natural and VIVID Colors High-Definition and Resolutions Multimedia Durable and Highly Functional Cable For use with Xbox. Ultra High Quality. Sold by UK gaming professionals. Enjoy the freedom to choose between traditional composite connection and RGB connection for improved image quality at your convenience. Composite or RGB Video. NOTE: This cable is used for Old Xbox not for Xbox 360. Enjoy better picture quality on modern TVs than with traditional AV connectors. Cable Length:1.8m. 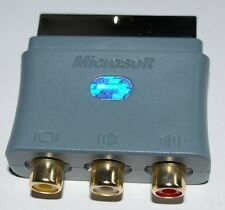 Tv adaptor for your xbox 360 console. This is the RGB HDTV AV High Definition AV Cable for Xbox. ü This RGB AV cable is exclusively for use with Xbox console. ü For use with Xbox. Enjoy better picture quality on modern TVs than with traditional AV connectors. Cable Length:1.8m. Gives a Higher Definition & More Vibrant picture. We will do our best service to solve your problem. Showcase stunning Xbox 360 high-definition graphics with the component connection on your HDTV. Play high-quality audio with the included stereo connection or use the optical audio port for digital sound. For Microsoft XBox Original Only (Not Xbox 360 or Xbox One). This is the RGB HDTV AV High Definition AV Cable for Xbox. This RGB AV cable is exclusively for use with Xbox console. model: Xbox Classic RGB. For use with Xbox. platform: Microsoft Xbox. Product Information. For Microsoft XBox Original Only (Not Xbox 360). OFFICIAL MICROSOFT PRODUCT! 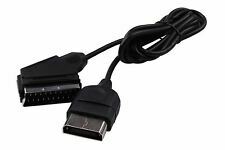 MICROSOFT XBOX 360 OFFICIAL RGB SCART CABLE TV LEAD ADAPTER NEW! From Dev Kit? Compatible Microsoft Xbox 360 console. Optical output to connect an SPDIF optical cable (not supplied). Audio and video signal output. Usually dispatched within 24 hours. Not compatible console JAP and US (NTSC). This RGB AV cable is exclusively for use with Xbox console. For use with Xbox. Enables displays with natural and VIVID Colors. Notebook Adapter. Pattern picture! Item may differ from the photo. The Konsolenkost-Team wishes you a lot of fun. Cancellation Right. Condition of Use. Privacy Notice. Important Notes. South Korea. Feature： Brand new and high quality X-BOX Classic 24P SCART RGB CABLE HD AV Cable Make playing your favourite console even easier with a new RGB Scart cable. Enjoy better picture quality on modern TVs than with traditional AV connectors. Simply connect to your console and plug the Scart connector into your TV. Gives a Higher Definition & More Vibrant picture. Cable Length:1.8m Color:Black Core of Cable:Bare Copper Wire Max Outside Diameter:7.8mm Pacakged Included:1PC Conversion : 1 inch = 25.4mm or 1mm = 0.0393 inch,1cm=10mm. Feature： Brand new and high quality X-BOX Classic 24P SCART RGB CABLE HD AV Cable Make playing your favourite console even easier with a new RGB Scart cable. Enjoy better picture quality on modern TVs than with traditional AV connectors. Simply connect to your console and plug the Scart connector into your TV. Gives a Higher Definition & More Vibrant picture. Cable Length:1.8m Color:Black Core of Cable:Bare Copper Wire Max Outside Diameter:7.8mm Pacakged Included:1pc RGB Scart HD AV Cable Conversion : 1 inch = 25.4mm or 1mm = 0.0393 inch,1cm=10mm Friendly Tips: 1. Please allow 1-3mm error due to manual measurement. Please make sure you do not mind before you bid. 2. The colors may have different as the difference display, please understand. Platform Microsoft Xbox 360. NON CONTINENTAL USA AK / HI / PR / APO / FPO / & OTHER US TERRITORIES. 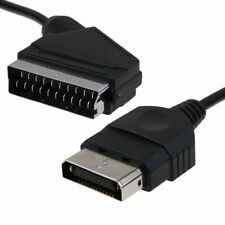 Descriptions: -High Quality cable of RGB Scart to Xbox Gen 1 connector -Compatible with Xbox Gen 1 -Made by Third Party Weight: 100g Cable Length: 165cm Note! Product picture is for reference only. 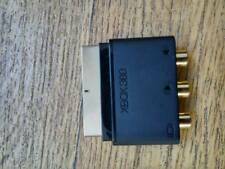 OFFICIAL Microsoft XBOX 360 Scart Adapter Rgb Av Connector Block plug . Condition is Used. Dispatched with Royal Mail 2nd Class Large Letter. Car Airbag Simulator Emulator Resistor Bypass SRS Kit Fault Finding Diagnostic. 1pc For BMW Grill M Sport Tech 3 Color Stripes Sticker Vinyl Decal Badge Emblem. Compatible: For Xbox 360, Xbox 360 slim (not xbox 360 E, super slim). Feature: Brand new and high quality X-BOX Classic 24P SCART RGB CABLE HD AV Cable Make playing your favourite console even easier with a new RGB Scart cable. Enjoy better picture quality on modern TVs than with traditional AV connectors. Simply connect to your console and plug the Scart connector into your TV. Gives a Higher Definition & More Vibrant picture. Cable Length:1.8m Color:Black Core of Cable:Bare Copper Wire Max Outside Diameter:7.8mm Pacakged Included:1PC Conersion: 1 inch=25.4mm or 1mm=0.0393inch. Compatible: For Xbox 360, Xbox 360 slim (not xbox 360 E, super slim). This cable produces the highest quality images and sound for the Xbox 360 on a standard definition TV. Cable Length: Approx.1.83M/6ft. X-BOX Classic 24P SCART RGB CABLE HD AV Cable Make playing your favourite console even easier with a new RGB Scart cable. Enjoy better picture quality on modern TVs than with traditional AV connectors. Simply connect to your console and plug the Scart connector into your TV. Gives a Higher Definition & More Vibrant picture. Cable Length:1.8m Color:Black Core of Cable:Bare Copper Wire Max Outside Diameter:7.8mm Pacakged Included:1pc RGB Scart HD AV Cable. Sortie de câble AV cable rgb. Type cable rgb. EAN Non applicable. _st_Modèle. OFFICIAL MICROSOFT XBOX 360. OFFICIAL XBOX 360. Official Microsoft product. Colour: Black. We try our best to send you the item in its best of condition. X-BOX Classic 24P SCART RGB CABLE HD AV Cable Make playing your favourite console even easier with a new RGB Scart cable. Enjoy better picture quality on modern TVs than with traditional AV connectors. Simply connect to your console and plug the Scart connector into your TV. Gives a Higher Definition & More Vibrant picture. Cable Length:1.8m Color:Black Core of Cable:Bare Copper Wire Max Outside Diameter:7.8mm Pacakged Included:1PC. This is the RGB HDTV AV High Definition AV Cable for Xbox. This RGB AV cable is exclusively for use with Xbox console. For use with Xbox. 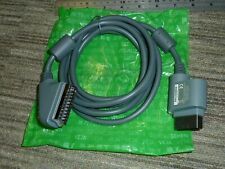 Madcatz Multi Console RGB Scart Cable - Playstation/N64/XBOX/Gamecube + RGB AV. As it is a joblot, consider spares or repairs. There are more lots here.